This quarter’s ORA™ Power Rankings properties work hard to keep their residents happy and have seen the direct impact reflected in their scores. Close to half, 21 properties, made their first ever entry to the Top 50 rankings. Everton at Bellmar, located in Dallas, managed by Knightvest Property Management, scored 96 to hold on to its number one spot for online reputation in the nation. Camden Plaza (Houston) and Modera 44 (Morristown) are once again in the top 3, with a swap in places since the last ORA™ rankings list. Camden Plaza, managed by Camden Property Trust, is the new number two with a score of 96. Modera 44, managed by Mill Creek Residential, is at the third position with a score of 95. 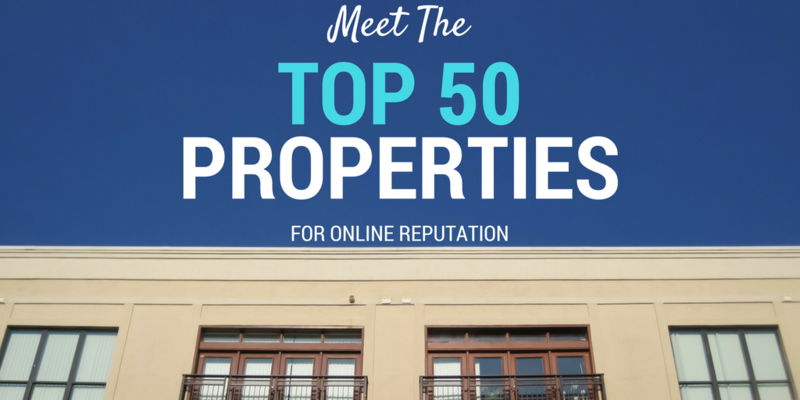 There are a few more properties that have made the Top 50 list two times in a row. Of those, The Courts of Devon, in Gaithersburg, managed by Bozzuto, has experienced the biggest gain. The Courts increased its ranking by 27 spots to jump from 44 to 17 this time. Welcome to the top 20, The Courts! The next biggest gainer is 1600 Glenarm Place, in Denver, managed by Red Peak Properties. Glenarm improved its ranking by 11 spots, making an impressive move from spot 41 to number 30. Bozzuto, with a whopping 8 properties in the Top 50 list, is once again the leading management company. At number two is Hawthorne Residential Partners with three properties. Three management companies tied for the third spot with two properties each – Equity Residential, Greystar, and AvalonBay Communities Inc. In terms of states, California leads the way with five properties in the Top 50 list. Washington, Maryland, Massachusetts each has four properties, followed by Virginia and Texas with three properties each. See the full list here: ORA™ Power Rankings. Did your property make the list? Get your ORA™ score to find out where you rank compared to the Top 50 in the nation! *In the case of ties in ORA™ scores, the property with a higher number of reviews is ranked higher.